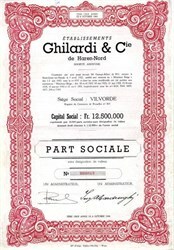 Beautifully printed certificate from Etablissements Ghilardi & Cie de Haren-Nord issued in 1944. This historic document was printed by Et. d'impr. Valero-Nicolay and has an ornate border around it. This item has the printed signatures of the Company's Administrators and is over 60 years old.